Cut each bread slices into four pieces. In a bowl, beat the egg with sugar until sugar dissolves. Add semolina to the egg mixture and mix well. Heat a frying pan and add 1 tbsp ghee/oil on medium- low flame. 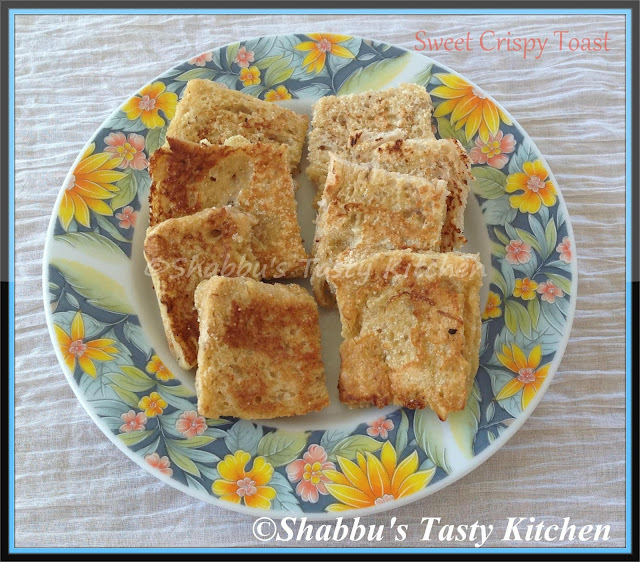 Simple and crispy toast ....Perfect with a cup of tea !!! Love to start my day with this toast,yummy. Delicious and crispy snack. Yummy! very delicious toast,yummy!! Participate & win e gift vouchers (worth Rs 1000& Rs 500)in Flavors Of Cuisines-"Chinese"
Healthy evening snack for kids.. I like this for breakfast...you won't believe me but this dish is my dogs favorite breakfast item..